I expected it will be more about the cool animals and less about the other stuff. The characters are not very interesting and the blonde sister of the main female character is just annoying as Hell and I hoped she will be eaten by one of those creatures. The animals are beautiful and funny, it´s a pity it wasn´t about Newt travelling the world and catching them in various creative environments. Quite disappointed! Story line was nowhere near as deep as her Harry Potter series - left lots of unanswered questions at the end. Special Effects were AMAZING! Visually stunning - but so much missing in the story line. Loved it!!! Awesome Movie!!! I want to see it again! great story, engaging and entertaining, without going into darkness thank you ms rowling! a remarkable triumph. one of the most entertaining films of the year. absolutely amazing! 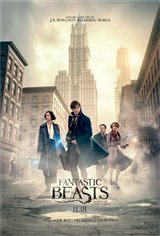 best Harry Potter movie yet! I cant wait for the second one to come out! I found this movie exciting and creative. Love all the characters and the little creature Pickett. It was a little dark but still a fantastic movie. Can't wait to see more. Story line was a bit confusing for me but still really enjoyed the movie.